Home»Android » Xiaomi uses state owned China Telecom A-GPS provider, but why? Satellite based navigation system has become run-of-the-mill nowadays. Well, I should probably use the term ‘GPS’ which is almost synonymous to satnav. Smartphone makers started to install such receivers inside the phones since early days. Smartphones often use assisted GPS (A-GPS) technology to get a faster time to first fix (TTFF) with the help of nearby cellular towers. A-GPS is particularly helpful in case of poor or unavailable satellite signal, e.g. in indoor locations. The Open Mobile Alliance (OMA) defined the protocol for smartphones to communicate with A-GPS providers. The IP based architecture is called Secure User-Plane Location (SUPL). The current revision of SUPL is v2.0 and the details of it can be found here. In Android, the SUPL implementation was accused earlier for leaking data. Vendors often include undocumented changes in their location stack. Modern Android versions by default use Google’s SUPL server (supl.google.com). The value is defined under config_gpsParameters section of stock framework resources of AOSP. After dissecting multiple firmwares and gathering user feedbacks, it can be seen that Xiaomi deliberately uses a third party SUPL server in MIUI. The address of the server is 221.176.0.55 which appears to be China Telecom’s AGPS provider. The same server is used in MediaTek Location Manager app in conjunction with MediaTek’s GPS chipset. 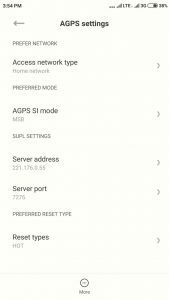 Xiaomi does provide an option to change the AGPS SUPL provider, but that particular option is hidden under global (both beta and stable) version of MIUI. To access the option, users need to search under MIUI settings for ‘A-GPS’ (without quotes) or use an activity shortcut maker app like this one. The Chinese builds of MIUI however make this option available under location settings. xiaomi.eu ROMs are similarly affected as they are based on Chinese MIUI builds. Interestingly Xiaomi ships the same SUPL provider on Poco F1, which is neither officially sold in China nor has MIUI China ROM support. Xiaomi users having poor GPS related experiences reported faster locking after switching from the Chinese AGPS server to Google’s SUPL provider. guys, the turkish mi8 fans found out the solution for the gps problem. I did it (translated in google translator) and now it’s ok.
download QuickShorcutMaker and search for a-gps settings. Access Network Type: Change to be the whole network. Server Port Number: 7276 and click the Save button. cool, it works great now and find all the satellites. I also had the same issue while playing Pokemon Go inside buildings – GPS gets dropped often for a short time (and egg distance stops counting when such errors occur). 1) Go to GPS settings on your phone. Select “Device only” accuracy. 2) Open Google Maps and try to get map to your location (click on a “point” button). App will ask if you want to turn on high accuracy settings. Agree. 1) Search for “A-GPS settings” on your settings app. 2) Replace A-GPS server “221.176.0.55” with “supl.google.com”. The former IP address belongs to chinamobile.com, and changing this to corresponding Google service is a good idea. This already helped me. If you need to experiment more, you can try choosing between “MSB” and “MSB” modes in the same settings page. We have verified that OnePlus phones use Google SUPL server after analysing the firmwares. Other prominent Chinese OEMs such as Huawei or OPPO are not examined by us yet.